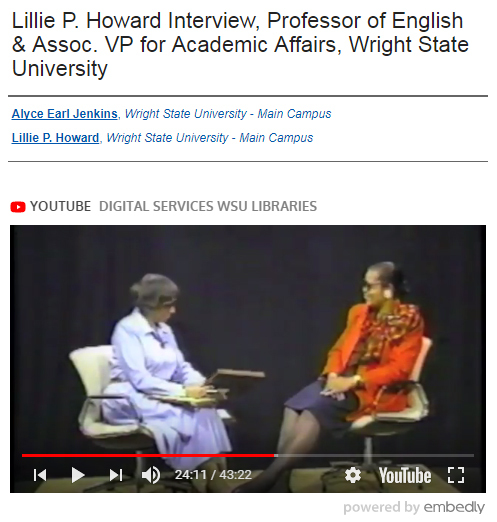 We are pleased to share that the “Profiles of African-Americans: Their Role in Shaping WSU” Oral Histories, from the University Archives, are now freely available online, anytime, through the Wright State University Campus Online Repository, at CORE Scholar: Profiles of African-Americans. 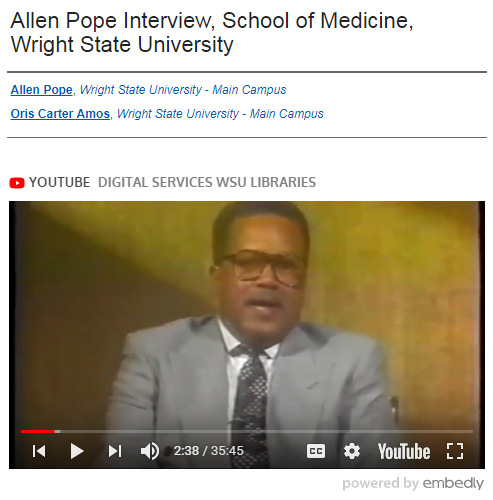 This collection of video oral history interviews, conducted in the early 1990s, includes African-American professors, administrators, board members, and other employees that helped shape Wright State University. Many of the interviews were conducted by Alyce Earl Jenkins, who donated the videos to University Archives. Users can view the original videos, as well as read or download a corresponding text transcription of the video’s content. This digital project has been a collaborative effort between the University Libraries’ Special Collections & Archives and the University Libraries’ Digital Services Department, which provided the digitization, metadata encoding, and uploading of digital content to CORE Scholar. Please visit the University Archives’ Digital Collections page to learn about additional online collections. This entry was posted in Collections, SC&A, University Archives and tagged African Americans, collections, CORE Scholar, digital collections, new collections, news, University Archives, Wright State University. Bookmark the permalink.